Even after the South Carolina church massacre during which nine African-American worshippers were fatally shot, and the subsequent public outcry that the Confederate flag be removed from the Statehouse, a new CNN/ORC poll shows that public opinion on the flag has not changed in 15 years. 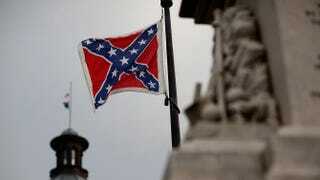 According to the poll, most still believe that the flag symbolizes Southern pride, not white racism. “The poll shows that 57 percent of Americans see the flag more as a symbol of Southern pride than as a symbol of racism, about the same as in 2000 when 59 percent said they viewed it as a symbol of pride. Opinions of the flag are sharply divided by race, and among whites, views are split by education,” the report on the poll states. The poll also reflects a stark contrast in views between blacks and whites. Seventy-two percent of African Americans polled see the Confederate flag, an artifact of the Civil War, as a symbol of racism, while just 25 percent of whites hold that view. The poll does note a “sharp divide” among whites; those with more formal education are more likely to see the flag as a symbol of racism.